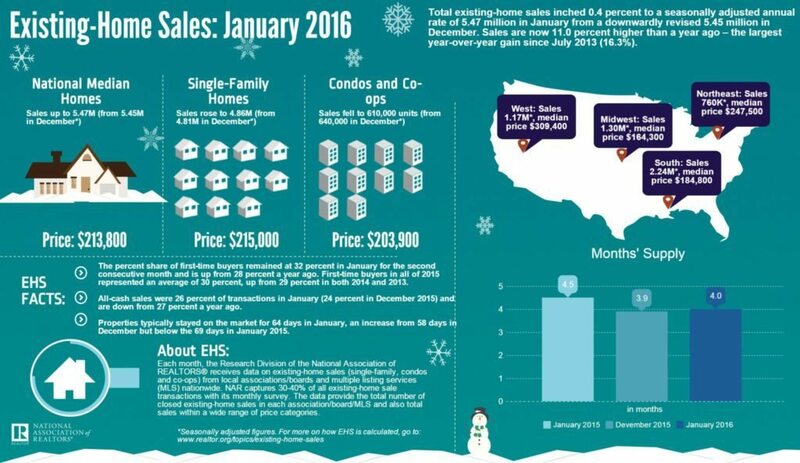 Single-family home sales in January 2016 were at a seasonally adjusted annual rate of 494,000. This is 9.2 percent below the revised December 2015 rate. It’s also 5.2 percent below the January 2015 estimate. The market composite index decreased 4.3 percent on a seasonally adjusted basis week-over-week. The refinance index decreased 8 percent week-over-week. The seasonally adjusted purchase index increased 2 percent week-over-week. The MiMi purchase applications indicator increased 9 percent in 2015. The national MiMi value is at 82.7. Year-over-year, the national MiMi improved 7.65 percent. Existing-home sales were at a seasonally adjusted annual rate (SAAR) of 5.47 million in January 2016. This is up 11.0 percent year over year. The median existing-home price for all home types was $213,800. The index rose 5.4 percent year-over-year in December. Portland led the way in price increases (11.4 percent), followed by San Francisco (10.3 percent) and Denver (10.2 percent). The national index rose 0.1 percent month-over-month. If recovery's here, where's the new construction? 'Liquidity drying up' -- another mortgage apocalypse? Could mortgage rates fall to 2-something?